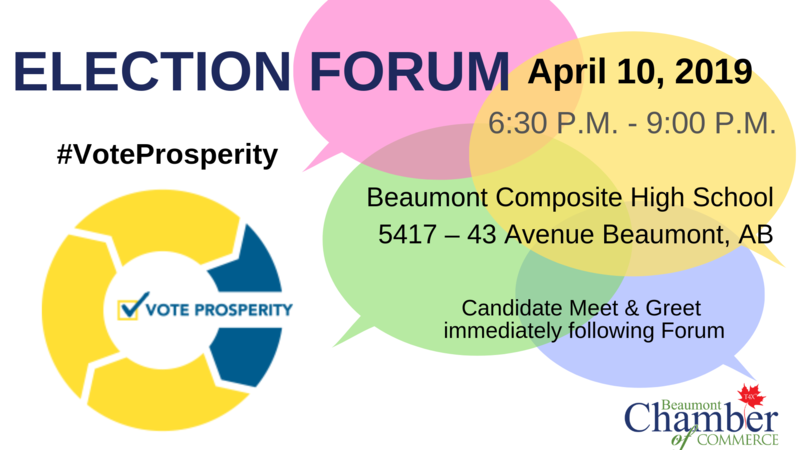 Please join the Beaumont Chamber of Commerce for the 2019 Provincial Election Forum. Hear directly from the candidates who are running to represent the riding of Leduc-Beaumont. Make sure you are informed and registered to vote on April 16th. As Albertans look towards the coming election, the Alberta Chambers of Commerce has developed Vote Prosperity: a platform for the 2019 provincial election campaign. It draws upon the ACC's grassroots-driven policy book and feedback received from our chamber members and is designed to provide voters an outline of priorities that will enable us to leverage Alberta's economic advantages and strengthen our global competitiveness. The Beaumont Chamber of Commerce will be focusing on our local candidates using Vote Prosperity to ensure that the issues important to our members are represented.